We’ve all heard of white water rafting, but black water rafting? That was a whole new ballgame for me. 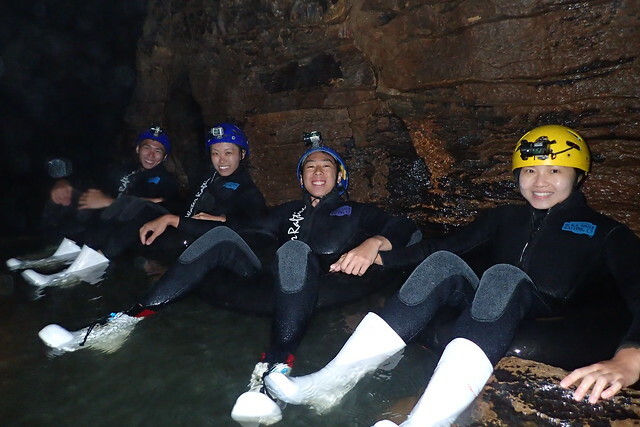 In short, black water rafting is having you sit on a tube that goes down a cave stream in pitch darkness. 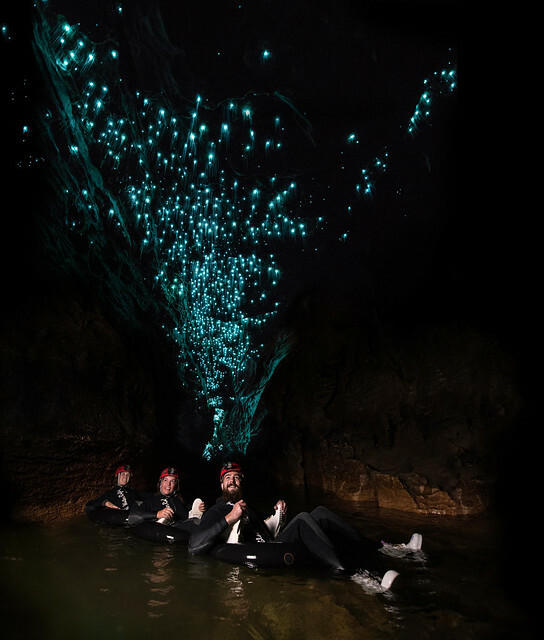 The limestone cave is made up of a number of interesting formations, such as waterfalls, stalactites, stalagmites and in Waitomo’s case, billions of glowworms. 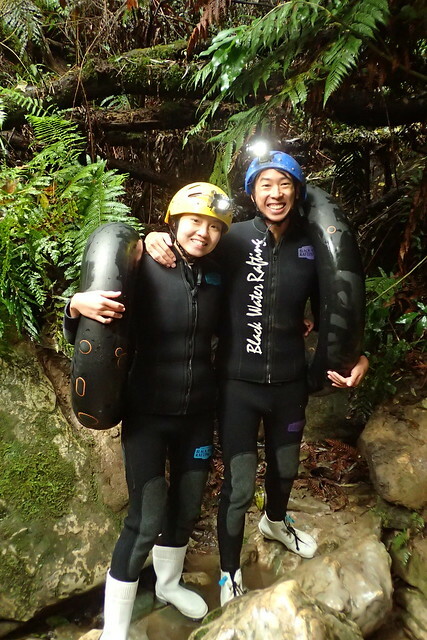 Waitomo in New Zealand is no stranger to black water rafting and we knew we had to give black water rafting a try, to tick off our adventure bucketlist. 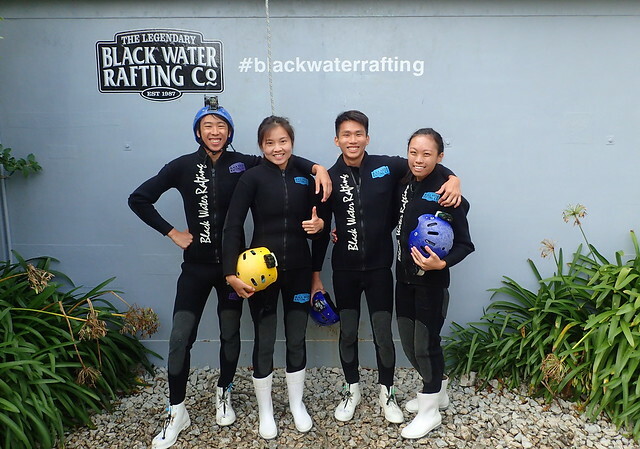 Being the first black water cave rafting operator in New Zealand, The Legendary Black Water Rafting Co. combines blackwater rafting and glowworm-watching all in one thrilling package. First we were brought to the changing room. Putting on a wet suit had to be the most challenging part of this adventure. The wet suit was thick, heavy and full of friction – you can imagine how (embarrassingly) long I took to put it on. Since the water in the cave does not see any light at all, water temperature is ~10 degrees. We went black water rafting in winter, so the waters were even colder. I can only marvel at the guides for being able to go through the entire black water rafting tour in the freezing waters not once, but multiple times a day. Thank goodness they provided an optional fleece top for us to don. Special socks and footwear were also provided, so all we really needed to bring were swimwear and a towel! We were then taken to a small river stream to familiarise ourselves with our tubes before black water rafting and gain greater insight on what we were in for. Following the briefing, we were driven to Ruakuri Cave, where the real action happens! A large part of black water rafting involved balancing on rocks as we made our way through the cave in pitch darkness, crawling under low ceilings, jumping backwards with our tubes down mini waterfalls in the cave, and best of all, watching glowworms twinkle above us on the limestone rocks. We learned that glowworms are actually flies in their larvae stage which light up to attract food. Come summer, there would be more of these bugs that light up because food is more readily available. The brighter they are, the hungrier they are. The silk that dangles from each larvae are called snares, and hold droplets of mucus to attract prey. With a maximum of 12 people per group, there were 2 guides that took meticulous care of everyone of us. Midway, the guides humoured us with New Zealand’s popular treat, chocolate fish! It is essentially chocolate coated on top of strawberry marshmallow that is in the shape of a fish. 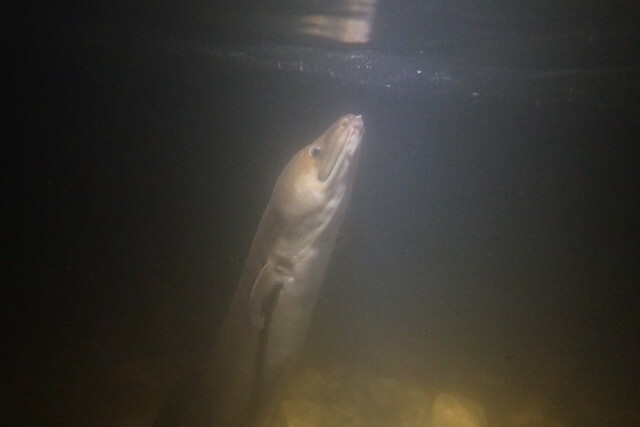 This is NOT the chocolate fish I was talking about, but an eel which our talented guide caught on camera. 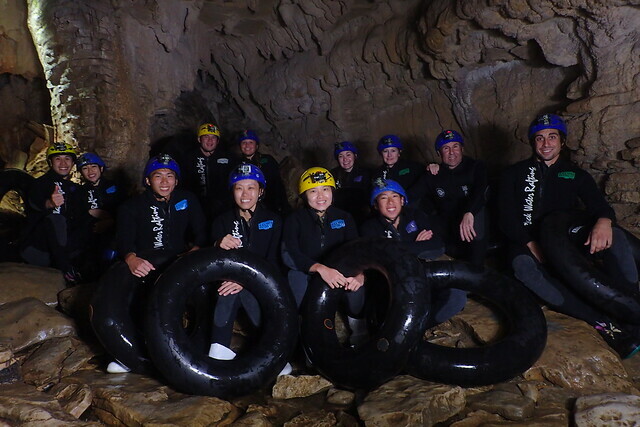 The black water rafting tour concluded with access to hot shower, hot soup and bagels. You can’t imagine how famished we were at the end of the adventure. 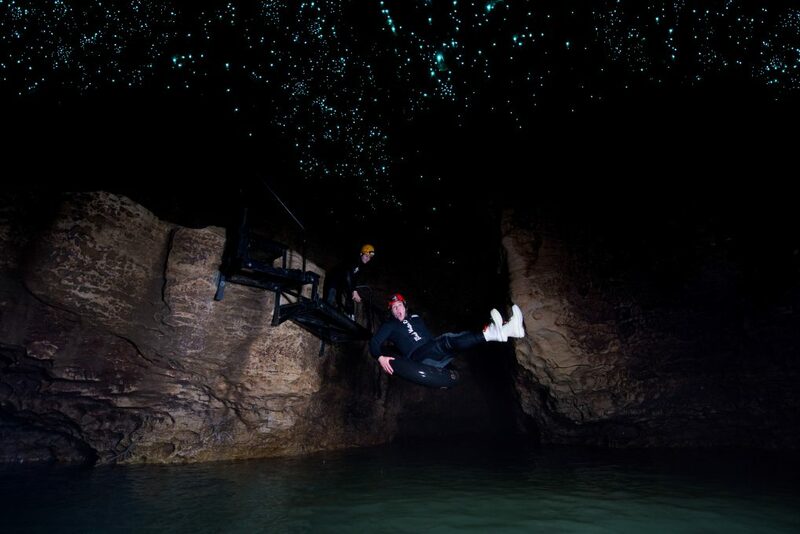 So much energy went into battling the cold in the cave and being in awe of the glowworms in action. This entire black water rafting trip took us around 3 hours, with readily accessible tour buses that stop right in front of the reception. 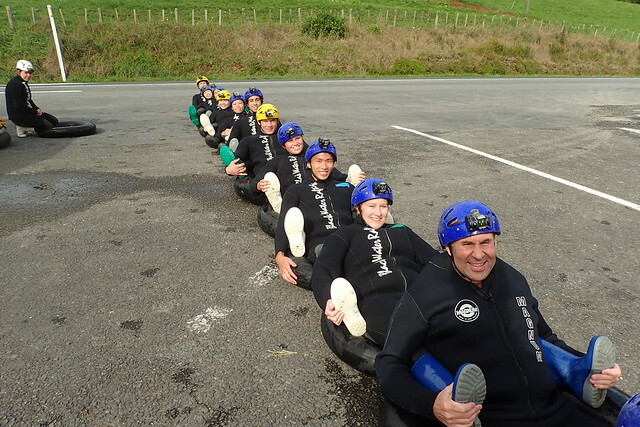 Special thanks to Koru Enterprises and The Legendary Black Water Rafting Co. for organising this tour for us while we were in New Zealand. Can’t get enough of New Zealand? Read the rest of my New Zealand posts! An explorer at heart, the world is Isabel's playground. She enjoys seizing every moment exploring every hideout and doing the unimaginable, like bungee jumping in Phuket and couchsurfing in Europe. If she had wings, she’d definitely be soaring right now. Also a fitness trainer, if she’s not at the gym, you can find her doing yoga or rock climbing! Read more about her on belaroundtheworld.com/about. Claim your FREE travel expense sheet! Region(s) you’re most interested about? Just send me life updates about you! oh my goodness! i’m heading to new zealand in november, have to put this on my list of potential things to do! That’s awesome! Weather must be lovely then. Where else are you planning to go and what is on your list? I’m glad you feel the same way too! What other activities did you try out in New Zealand and how long did you live there for? This sounds amazing! What an incredible adventure to explore caves. It’s going on my bucket list. Thanks for sharing your travels with us. Happy to share exciting adventures, as always. Thank you for your comment! Join the newsletter and get exclusive travel tips, giveaways and more! There are times to stay put, and what you want will come to you. And there are times to go out into the world and find such a thing for yourself. © 2019 Bel Around The World. All Rights Reserved. Website design by Hello Pomelo.